Paperback, 8.25 x 10.50 in. / 160 pgs / 221 color. Text by Ludo van Halem, Trudy Nieuwenhuijs-van der Horst, Laura Stamps. 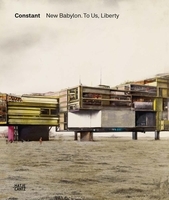 Constant Nieuwenhuys (1920–2005), known as Constant, was a founding member of the Cobra group and the Situationist International, and the artist behind the utopian architectural New Babylon project. This publication examines his practice in the 1950s and his transition from Cobra to New Babylon. 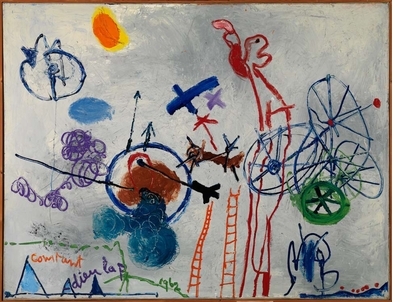 In this decade, the fantasy figures of Constant’s Cobra period were followed by abstract painting, a transition from the two-dimensional to the three-dimensional plane with the architectural models and sketches made for the New Babylon project, and ultimately a return to painting with the color experiments that he pursued from 1969 until his death in 2005. 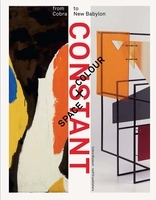 Constant: Space + Colour gathers rarely seen works alongside a short selection of texts written between 1949 and 1965, which provide a glimpse into the radical transformations of these years. 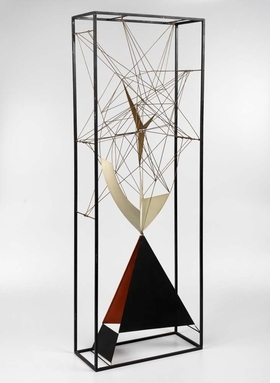 Constant, "Construction dans un volume (Wire Construction in Prism)," 1957. The keen catalogue Constant: Space + Colour; From Cobra to New Babylon inadvertently bathes the utopian artist Constant Nieuwenhuys in a surprising light. In a 1948 manifesto published in the first issue of Reflex magazine, which he co-founded with likeminded artists Corneille, Karel Appel and his brother Jan Nieuwenhuys, radical Dutch artist, author, designer and musician Constant wrote, "A painting is not a structure of colors and lines, but an animal, a night, a cry, a man, or all of these together." A founder of the CoBrA movement and an important member of the Situationist International, Constant devoted two decades of work to his utopian vision for New Babylon, "a world wide city for the future." Adieu la P. (1962), pictured here, "hints at a farewell to painting," according to Constant: Space + Colour, From Cobra to New Babylon, which features 221 color reproductions and ten texts written by Constant himself, eight of which have never been published before. "Urbanism, for Constant, was not limited to spatial planning; it was an entirely new, all-encompassing art form whereby visual artists and engineers would work together on a new city of the future." FORMAT: Pbk, 8.25 x 10.50 in. / 160 pgs / 221 color.